My usual ritual for finding an underwhelming fossil fish is to go to one of our fossil fish drawers and within about two minutes in the first drawer I’ll find something that’s perfectly underwhelming. This month, I found this beauty whilst fixing our fossil drawer units and what instantly caught my eye is the apparent absence of anything resembling a fossil fish. Have a butchers at the grid below can you find a fossil fish? Hint- it”s not in F-Zero (show me your moves). Did you find it? I’m impressed if you did because I’m not 100% sure where it is. Don’t be fooled by the deceptively fish-shaped iron banding that starts in E2 and ends in B5, that’s a result of weathering and sedimentation. I’ve combed over this specimen and it’s counter part with my constantly disappointing but affordable USB microscope and there’s a bit of brown in D2 which looks less like not a fossil fish than the rest of the slab. Here’s what it looks like once the USB microscope has converted it into an impressionist painting. Impressionist interpretation of LDUCZ-V797 created by the low resolution of the perpetually disappointing but affordably cheap USB microscope. 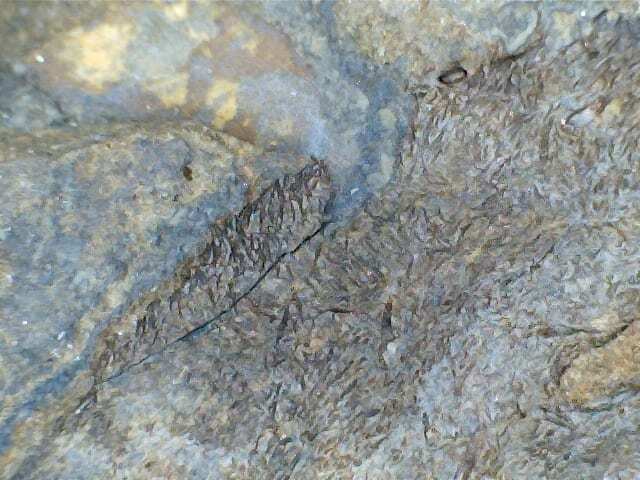 Remarkably, this ‘fossil’ has been identified as Silurian species Birkenia elegans. In isolation there’s no way that we can confirm this identification. I suspect, as with other fragmentary fossils I’ve featured which have been suspiciously identified to species level, this was an example of many specimens excavated at the same time so anything ‘bony’ looking of a certain size was lumped as fish species X or Y already known from the site. From our old fossil catalogue, this fossil is indeed one of a series of fossils collected from the Slot Burn Formation near Muirkirk in East Ayrshire, Scotland. Even though we don’t have enough here to confidently identify it to species level I’m going to stick with the given identity for the purposes of this blog. Birkenia elegans is a species of anaspid fish, jawless fish who lack the bony head shield found in other early jawless fish, known from Northern Europe. If you’re a regular Grant Museum visitor the name may ring some bells and that’s because we have a lovely little school of plaster Birkenia models in our appropriately named fossil fish models case. Meet Pugh, Pugh, Barney McGrew, Cuthbert and Dibble. AKA LDUCZ-V1069 Models of Birkenia on display in the Grant Museum. 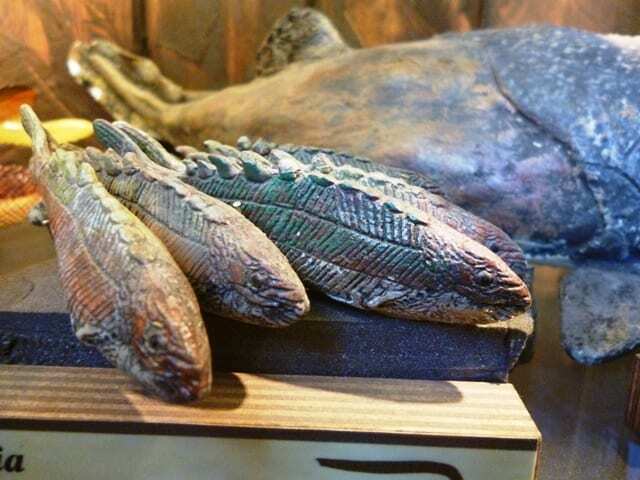 I’ve seen these models at a number of natural history museums as part of a set of Devonian and Silurian plaster fish models but surprisingly, nobody seems to know who made them and when. If you have any information, please pop it in the comments. 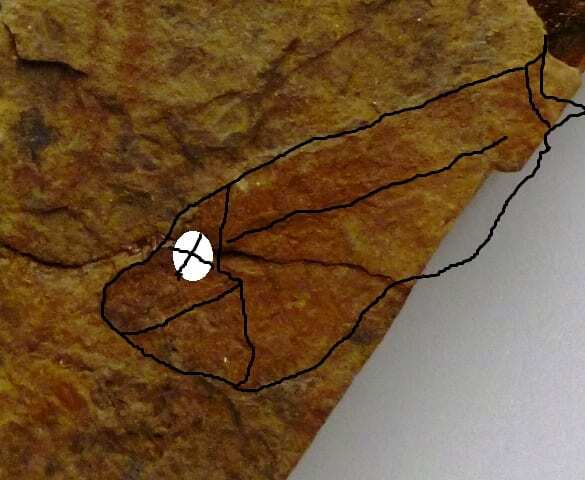 Highly skilled reconstruction from counterpart of LDUCZ-V797 showing extremely clearly what this fish may have looked like without a shadow of doubt or any confusion at all. Research When Birkenia was first described in 1898 it was assumed that anaspid fishes had heterocercal tails (with a long top lobe of the tail fins) not hypocercal tails (with a long bottom lobe of the tail fins) so for over 20 years, Birkenia was reconstructed upside down with apparently no comment on the mouth and eyes being the wrong way around (Traquair 1898). This was corrected in 1924 after the discovery of much better preserved anaspid fossils from Norway (Kiaer 1924). 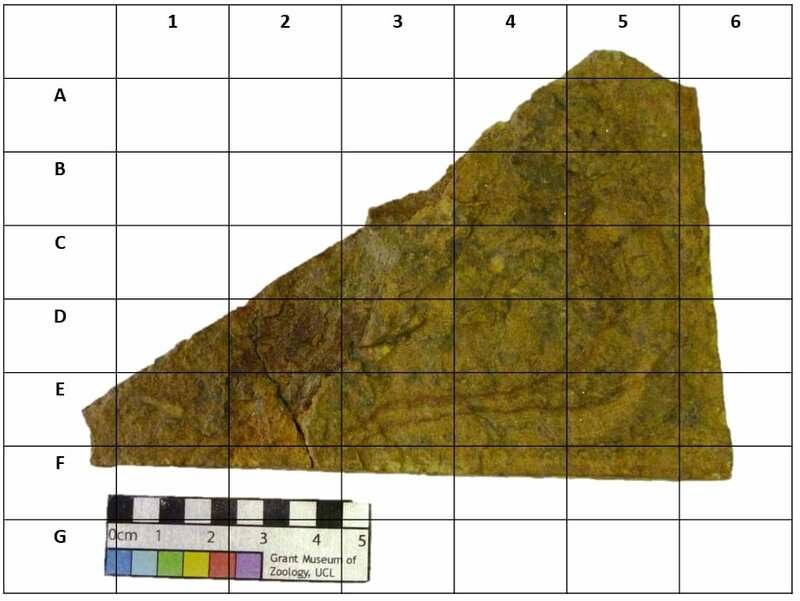 From a quick scan of the wider literature, Birkenia is often mentioned in the same breadth as being notable for a lack of anatomical features even in beautifully preserved specimens and I quote “In fact, beautifully preserved specimens of well-known taxa such as Birkenia and Rhyncholepis, respectively from the Silurian of Scotland and Norway, yield very few anatomical details” (Blom 2005). The main interest in Birkenia has been in passing through reflections of the anatomy of the gill openings in the study of the timing of the evolution of jaws. In Society You won’t be surprised to find that Birkenia seems to have had little impact in wider society. A telltale sign that this is the case is when images of the Grant Museum models and dictionary links appear on the first page of speculative Google searches to find some evidence of a broader cultural impact. Amongst the slimmest of pickings it appears that at least one person has made a Birkenia themed calendar although my Japanese isn’t up to scratch so I have no idea what’s actually going on on this webpage. Blom, H. 2005.Interrelationships and evolutionary history of anaspid fishes. Abstracts of Papers: Sixty-Fifth Annual Meeting Society of Vertebrate Paleontology Mesa Southwest Museum and Phoenix Marriott Mesa Mesa, Arizona October 19-22,2005. Journal of Vertebrate Paleontology. Vol. 25, No. 3, Supplement. Abstracts of Papers. Sixty-Fifth Annual Meeting, Society of Vertebrate Paleontology (Sep. 7, 2005). Kiaer, J. 1924 The Downtonian fauna of Norway, 1. Anaspida. Norske Vidensk Academien Skrifter, 6, 1–139. Traquair, R.H. 1898. Notes on Palaeozoic fishes, II. Annals and Magazine of Natural History 7, Series II, 67–70.